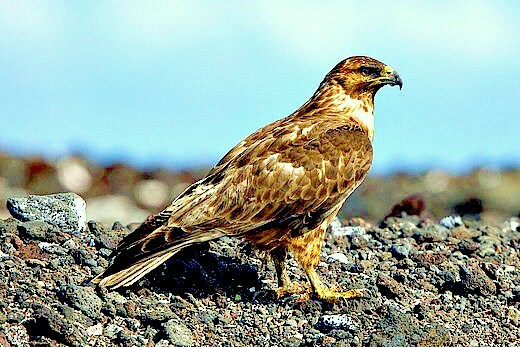 The Galápagos hawk is a large, dark coloured hawk with broad wings, and a broad tail. Adults are sooty brownish-black in colour with a grey tail barred with darker stripes. The legs and skin at the base of the beak are yellow and the bill is greyish-black. Immature birds have blackish-brown upperparts, mottled with buff and white; the tail is off-white with wavy dark bars and their underparts are buff-coloured with a white throat flecked with blackish-brown spots. Males are noticeably smaller than females. The most typical call is a series of short screams that have been described as ‘keer, keeu’. Occasionally a rapid ‘cher, cher, cher’ is heard. When on the wing a scream is produced in bursts of three to five.